Flipkart sale offers continue into the second day of the Big Freedom Day Sale, and it’s pouring deals and discounts across categories. Electronics, particularly mobiles, remain the hottest categories in sales, and the Flipkart sale does not disappoint on that front. You can get discounts on popular iPhone 7, iPhone 6s, and Android phones in the sale, along with deals on TVs, laptops, tablets, gaming consoles, etc. But with so many great deals on offer, it can become a little difficult to determine which offers the most value for your money and so we have compiled the list of best Flipkart sale offers you can get today. The Apple iPhone 7 32GB is down to Rs. 42,999 (MRP Rs. 56,200), one of its lowest price points so far. You can get an additional up to Rs. 15,600 off with an exchange offer and/ or an additional Rs. 1,750 off with HDFC Bank card payments for the duration of the Flipkart sale. The price is similar to what Amazon is offering during the Great Indian Sale, but if you’re interested in Flipkart’s exchange offer or want to pay with an HDFC Bank card, then this might be the deal for you. The iPhone 7 is powered by Apple’s A10 chip and features a 4.7-inch Retina HD Display. It features a 12-megapixel primary camera and a 7-megapixel front-facing camera. The Lenovo Phab 2 32GB phablet is down to Rs. 9,999 (MRP Rs. 10,999) during Flipkart’s The Big Freedom Sale. You can get up to Rs. 9,000 off as an exchange offer. 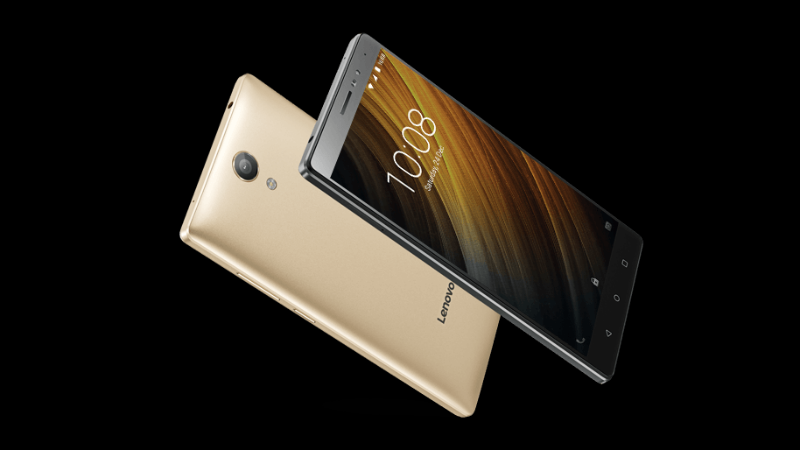 The Lenovo Phab 2 features a 6.4-inch HD display and is powered by the MTK8735 processor supported by 3GB of RAM. It comes with a 13-megapixel primary camera at the rear and a 5-megapixel front-facing camera. The iPhone 6s 32GB is down to Rs. 35,999 (MRP Rs. 46,900) on Flipkart. The exchange offer can let you have an additional Rs. 15,600 (maximum) discount, and another Rs. 1,750 off if you pay with HDFC Bank cards during the sale period. 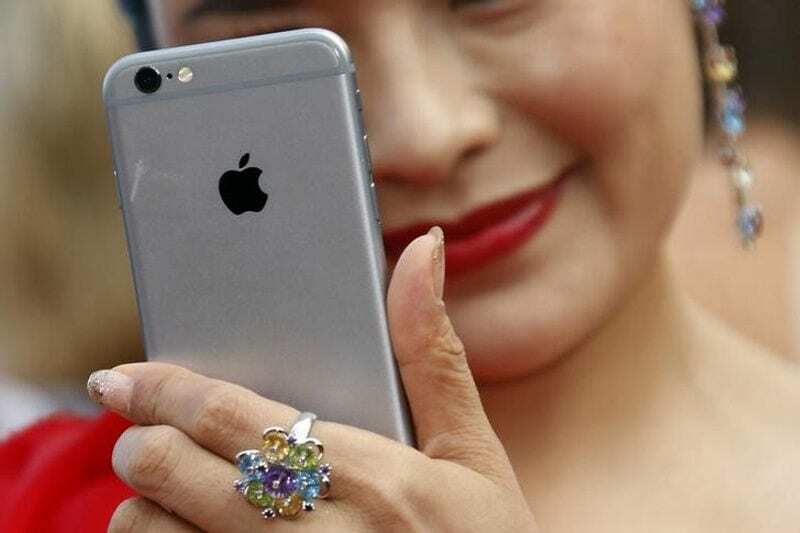 The iPhone 6s features a 4.7-inch Retina HD Display and is powered by Apple’s A9 chip. The smartphone comes with a 12-megapixel primary camera and a 5-megapixel front-facing camera. ALSO SEEAmazon, Flipkart, and Paytm Mall Sales: Who Is Offering the Best Deals? Canon EOS 1300D DSLR is available at a discounted price of Rs. 23,499 (MRP Rs. 31,995) as part of the Flipkart sale. The DSLR camera comes with EF-S 18 – 55 IS II lens. You also get a free 16GB SD card and a camera bag with the purchase. The camera is powered by an 18-megapixel APS-C CMOS based sensor and is powered by Canon’s DIGIC 4+. It includes support for Wi-Fi and NFC connectivity. The latest iPad Pro 64GB 10.5-inch with Wi-Fi is down to Rs. 47,405 (MRP Rs. 50,800) on Flipkart’s Big Freedom Sale. You can grab another Rs. 1,750 off the marked price by paying with an HDFC Bank card during the Flipkart Big Freedom Sale. That’s still a very decent deal for the latest iPad Pro. The new iPad Pro 10.5-inch is powered by the A10X processor and features Apple’s ProMotion technology. The iPad Pro comes with four speakers that offer a better audio experience. The 10.5-inch display runs at a resolution of 2224×1668 pixels. There’s a 12-megapixel primary camera at the back and a 7-megapixel front-facing camera. The Sony Bravia 40-inch full HD LED TV (model: KVL–40R352D) is down to Rs. 38,999 (MRP Rs. 47,900) during the Flipkart sake. You can buy the TV with a no-cost EMI offer, use an exchange offer to get another Rs. 12,000 off and pay with an HDFC Bank card to get another Rs. 1,750 off. The Sony Bravia 40-inch full HD LED TV comes with two HDMI ports and a single USB port. The Lenovo PA 10400 mAh power bank is down to Rs. 849 (MRP Rs. 2,499) on Flipkart. That’s a decent price for a 10400 mAh power bank. Power banks like these can be great especially if you’re planning to go on a trip and don’t want to be left with a smartphone or a tablet without any juice. Lenovo’s power bank comes with two USB ports, each offering a maximum output of 2.1 A. The Google Pixel XL 32GB is down to Rs. 48,999 (MRP Rs. 67,000). You can exchange your old smartphone and get up to Rs. 15,600 off on your Pixel XL purchase during the Flipkart sale. If you’re not keen on buying the new Pixel 2 XL smartphone that is expected to launch later this year, the Pixel XL is still a decent smartphone at this price. The Pixel XL features a 5.5-inch QHD display and is powered by the Qualcomm Snapdragon 821 chipset. It runs Android 7.1 out of the box. If you prefer a deal on the smaller Google Pixel, check out our picks of the Amazon Great Indian sale. Japan’s Sony on Tuesday reported its highest-ever first-quarter operating profit, taking the electronics giant one step toward its highest annual profit in two decades on the back of robust sales of image sensors. In a vote of confidence for Sony’s turnaround under Chief Executive Officer Kazuo Hirai, the firm’s shares have risen by around 40 percent this year to nine-year highs. The box-office success of its Spider-Man: Homecoming (Review) film has also fuelled hopes of a rise in earnings for Sony’s pictures business, which is working through a restructuring plan. Profit increased 2.8 times to JPY 157.61 billion ($1.43 billion or roughly Rs. 9,164 crores) in April-June, exceeding the previous first-quarter record of JPY 121.3 billion set in 2007. The result compared with a Thomson Reuters Starmine SmartEstimate of JPY 129.14 billion drawn from 10 analyst views. The profit surge comes mainly as Sony’s image sensor business returned to stability having recovered from earthquake damage sustained a year ago, the company said. Sony’s semiconductor division, which includes image sensors, posted an operating profit of 55.4 billion yen, reversing the year-earlier loss of JPY 43.5 billion, as operations at a key plant fully resumed to meet brisk demand for image sensors for smartphones. The consumer electronics business was also profitable as it focused on high-end television sets and smartphones without seeking to increase in scale. Together, strong performance across Sony’s divisions is pushing profit to golden-era levels. Nevertheless, analysts said the firm is yet to find long-term drivers of growth. With the future in mind, Sony is using its newly recovered financial strength to venture into acquisitions. On Monday, it said it had bought most of the distributor of the English-language versions of Dragon Ball Z and One Piece animations. The firm maintained its profit forecast of JPY 500 billion for the year ending March. While that is below the market’s average forecast of JPY 562.19 billion, it would still be the highest since the company made JPY 526 billion in the year ended March 1998, when it enjoyed strong sales of its first PlayStation games console and other electronics. It also benefited from box-office hit Men in Black. 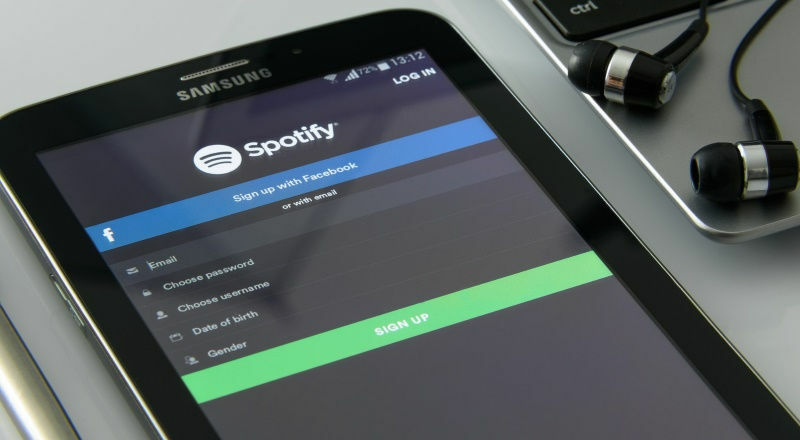 Spotify has reached a licensing deal with a second major label, Sony Music Entertainment, according to media reports, setting the stage for a US stock market listing by the music streaming leader. Recently valued at $13 billion (roughly Rs. 83,810 crores), Sweden’s Spotify is planning a direct listing on the New York Stock Exchange later this year or in early 2018, sources told Reuters in May. Sony’s top artists include Adele, Beyonce and Shakira. Spotify is also in talks with Warner Music Group , Billboard reported. Favourable royalty terms are crucial for Spotify to attain profitability and to make it a viable long-term holding for investors. 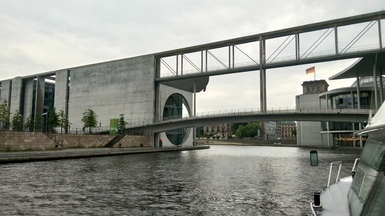 The company reported a EUR 349 million ($400 million) operating loss, a 47 percent increase on a year earlier, even as revenue grew 50 percent to EUR 2.93 billion. In April, it signed a multi-year licensing deal with Vivendi’s Universal Music Group, with a similar two-week release window for new albums and a break on the royalties Spotify pays Universal. It also signed up digital agency Merlin, on behalf of more than 20,000 independent labels. Last year, Universal held a 28.9 percent share of global music label revenue, Sony Music generated 22.4 percent and Warner 17.4 percent. Independent labels made up the remaining 31.3 percent, MIDiA Research data showed. Spotify has fended off competition from rival Apple Music, with nearly double the number of paying subscribers. In March, Spotify said it had more than 50 million paying subscribers and 140 million active users, including free listeners. Apple reported 27 million music subscribers last month, up from 20 million in December. Spotify declined to comment. Sony Music Entertainment and Warner Music Group did not respond to requests for immediate comment. 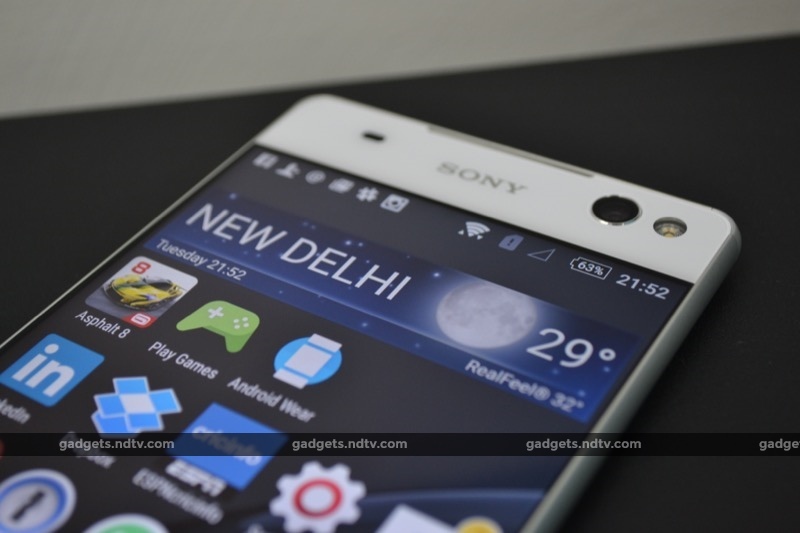 Sony Xperia C5 Ultra Dual is the third ‘Ultra’ device to have launched in India. Sony introduced the moniker with the Xperia Z Ultra, which was a flagship-level device in terms of specifications, but had a screen that was almost tablet-like as far as the size is concerned. The device got good reviews, though it was perhaps a little ahead of its time as far as people’s comfort with huge phones is concerned, and in the end, perhaps just a little bit too big for its own good. With the next member of the series, Sony toned things down a bit with the launch of the Xperia T2 Ultra Dual, which had a 6-inch display. Sadly, the rest of the specs were watered down as well. The T2 Ultra was a mid-ranger at best in terms of specifications; a correction that diverged a bit too far from the Xperia Z Ultra. If you are even considering buying the Sony Xperia C5 Ultra Dual, you hopefully know this very basic fact about the device – it’s a big phone. While Sony has managed to shave a millimetre of length and more than 4mm of width compared to the Xperia T2 Ultra dual, the Xperia C5 Ultra is still large enough to be noticed wherever you go. The Sony Xperia C5 Ultra Dual is heavier and slightly thicker than the T2 Ultra, while also sporting a marginally smaller battery. 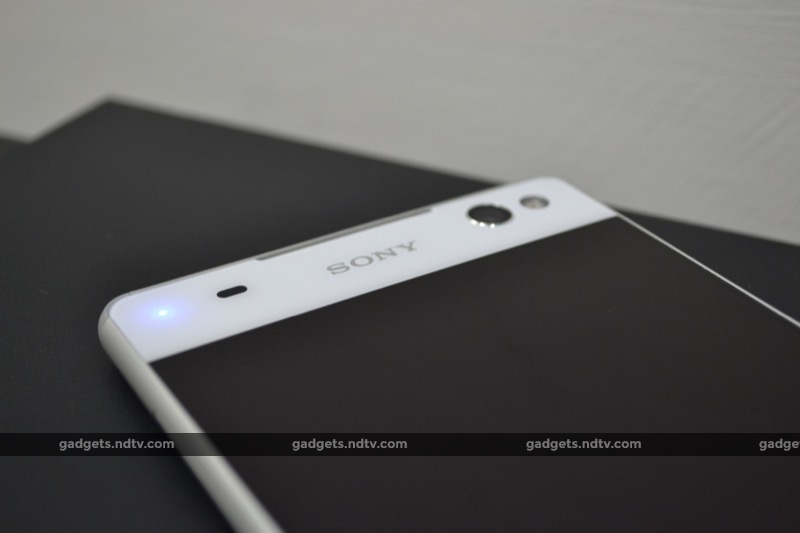 In terms of build quality, we have no complaints about the Sony Xperia C5 Ultra Dual. Our white review unit had a glossy back finish, which is also the case with the other two colours the phone is available in – Black and Soft Mint. The glossy back means the phone is a little prone to smudges, but they aren’t really noticeable until you look carefully, at least on the white version. Though plastic and glass dominate most of the back and front, the Sony Xperia C5 Ultra Dual is built around a metallic frame, with plastic corners ostensibly to allow for better antenna performance. In terms of the layout of ports, there’s nothing extraordinary here, which is good. The 3.5mm audio port sits on the top of the device, with the Micro-USB port and microphone making their presence felt at the bottom. The left has a cover that can be pulled out to reveal the distinct microSD and dual Nano-SIM trays. The Sony Xperia C5 Ultra Dual comes with on-screen Back, Home, and Application Switcher buttons. The most striking part of the right is the signature metallic, circular power button placed slightly above the halfway mark. There’s a volume rocker right below that, followed by the dedicated camera button towards the bottom. There’s a Sony logo right above the display, with a notification LED to its left, and the 13-megapixel selfie camera and a LED flash to its right. The back is pretty symmetrical, with six centre-aligned elements – the rear camera, LED flash, and a noise-cancelling microphone followed by three logos. The phone is obviously big overall, but even those with medium-sized hands shouldn’t have trouble holding the device. We needed to shift our grip to reach the upper regions of the screen, which is no surprise given the size of the display. Overall, the design of the Sony Xperia C5 Ultra Dual is quite comfortable and ergonomic for a device of its size. The Sony Xperia C5 Ultra Dual comes with a 6-inch full-HD display, a welcome improvement over the Xperia T2 Ultra dual, which had a 720p panel which just doesn’t look good when scaled up to this size. The screen goes edge-to-edge on the left and right, which explains how Sony has been able to make the C5 Ultra narrower than the T2 Ultra and still maintain the same display size. By default, the colours on the display of the Xperia C5 Ultra Dual are rather neutral – some may even call them boring – but you can choose between the Mobile BRAVIA Engine 2 and the Super-vivid mode options from the settings to find a colour gamut that’s more to your taste. You can manually adjust the white balance as well, if you are into that kind of stuff. The display has good viewing angles and is sufficiently bright, though you may find yourself manually adjusting the settings to see things at maximum brightness. The Sony Xperia C5 Ultra Dual is powered by a 1.7GHz oct-core MediaTek MT6752 SoC along with 2GB RAM. It comes with 16GB of internal storage, out of which almost 9GB is accessible by users. Pre-installed apps include Chrome, Facebook, News from Socialife, BIGFLIX, OfficeSuite, AVG, Jive, Real Football and File Commander amongst others, though a majority of these apps can be uninstalled to get more free space. You can get up to 200GB of additional storage via the microSD slot. The Xperia C5 Ultra Dual runs Android 5.0 Lollipop with Sony’s own skin on top. Sony has added some useful features keeping in mind the extra real estate on offer on this big phone. For example, you have ‘small apps’, the company’s take on floating apps that can run on top of other apps. You can choose from a bunch of pre-installed small apps, download more from the Play Store, or run your favourite widget as a small app. Sony has also tweaked some parts of the UI for easier operation with one hand (see screenshots below). 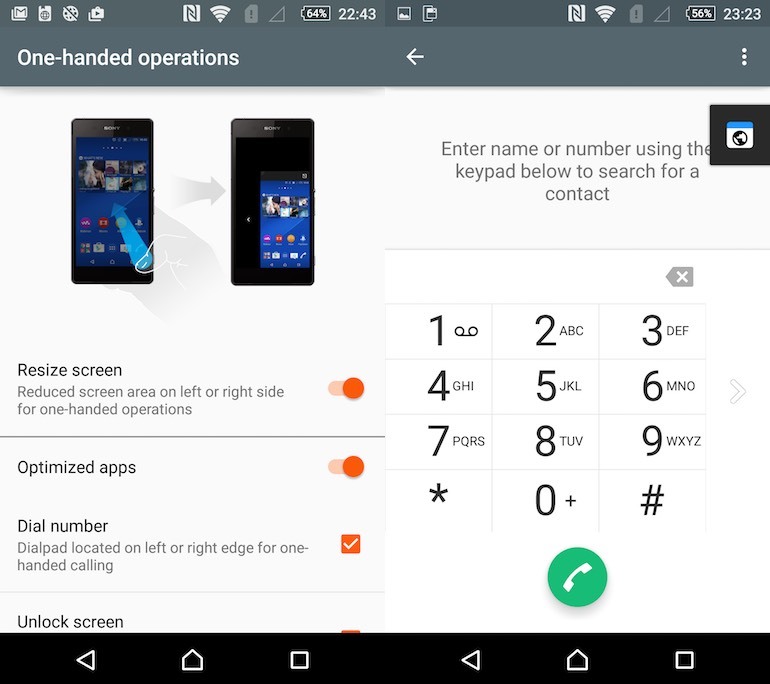 Note how the keypad has shifted to the left to make it a little easier to reach the keys when holding the Sony Xperia C5 Ultra Dual in your left hand. Tap the arrow to shift it towards the right. The Sony Xperia C5 Ultra Dual had no problems playing a full-HD video file encoded at a high bitrate, and games like Asphalt 8 ran without any hiccups or dropped frames. We played the game for over 20 minutes at a stretch, and while the phone got noticeably warm, overheating was never really a concern. The phone comes with 4G support and is compatible with the LTE networks deployed in India so far. We faced no issues in terms of call quality, though the loudspeaker sounded rather tinny, especially relative to the overall size of the device. The Sony Xperia C5 Ultra Dual comes with FM radio and USB OTG support. Thanks to the large screen, the on-screen keyboard feels well spaced out, which, combined with the good default keyboard, means the overall experience is amongst the best we’ve had while typing on glass. 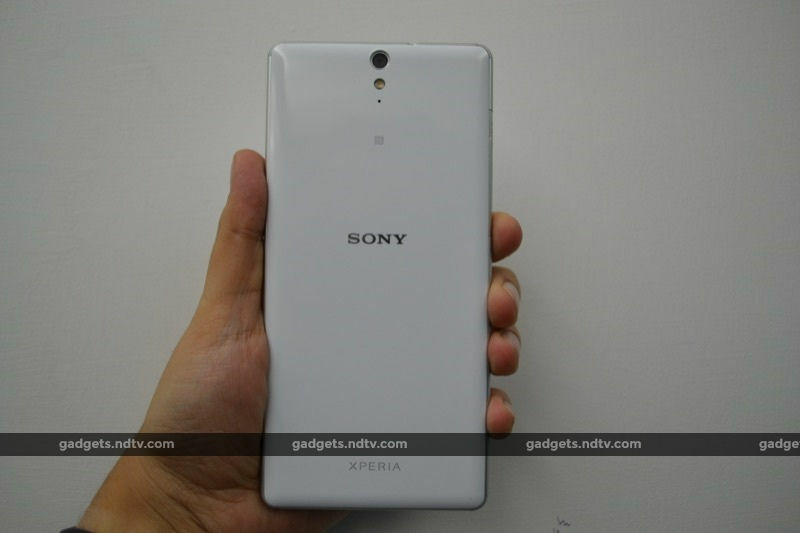 The Sony Xperia C5 Ultra Dual has a 13-megapixel rear camera, which is not uncommon these days. However, the phone’s front camera also sports the same resolution, which is a number that’s been touched only by a handful of phones. For all its struggles in the smartphone business, Sony phones have traditionally been known for their good cameras – something that’s backed up by the fact Sony’s camera unit supplies sensors to some of the world’s top smartphone manufacturers including Apple – and the Xperia C5 Ultra Dual is no exception. The rear camera takes good-looking pictures with largely accurate colour reproduction when there’s ample light, but the amount of detail captured could have been improved. While initially we weren’t entirely happy with the low light performance of the camera, we received a software update (build 29.0.B.1.55) during the time we spent with the device which seemed to bring improvements on this front. 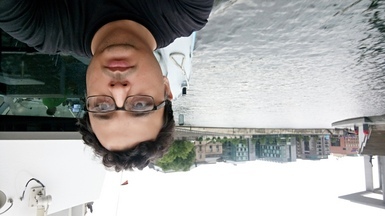 Sample shot by rear camera (left/ top) and selfie camera (right/ bottom). Click for full version. Coming to the monstrous selfie camera, it’s safe to say that the images captured by it are amongst the best we’ve seen from a front shooter. Video captured by the front and rear cameras was of average quality. As far as the software is concerned, the camera app that ships on the Xperia C5 Ultra Dual is the one we’ve seen on other Xperia smartphones as well. It comes with some pre-installed modes and you can extend its capabilities by downloading more modes. 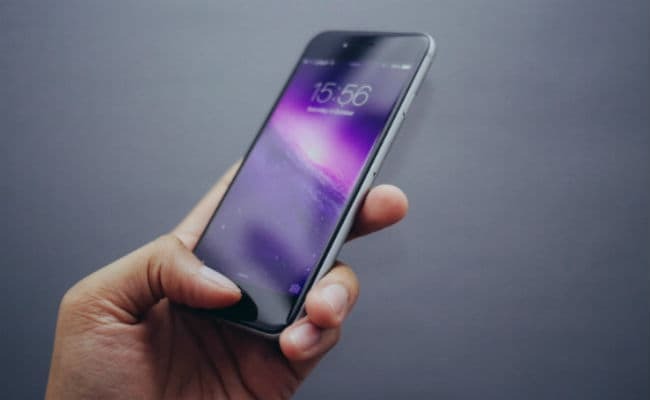 The app has enough to keep everyone happy – those looking for stress-free clicking, and even people who desire a bit more control over their pictures. The performance of the Xperia C5 Ultra Dual in our battery video loop test was average, with just under 8 hours of playback time. In terms of real world usage, we had no problems getting through our work days on a single charge. This anomaly is not uncommon with big-screen phones, which tend to underperform in test scenarios that require the display to always be on, but there’s potential to do better in real world scenarios where display is off a lot of the time. The Sony Xperia C5 Ultra Dual is certainly one of those phones, with good standby time. The battery life is admirable even when the phone is connected to 3G/4G networks and functioning as a hotspot. As long as you are not constantly playing games and watching videos, you will be extremely happy with the battery life of the Xperia C5 Ultra Dual. 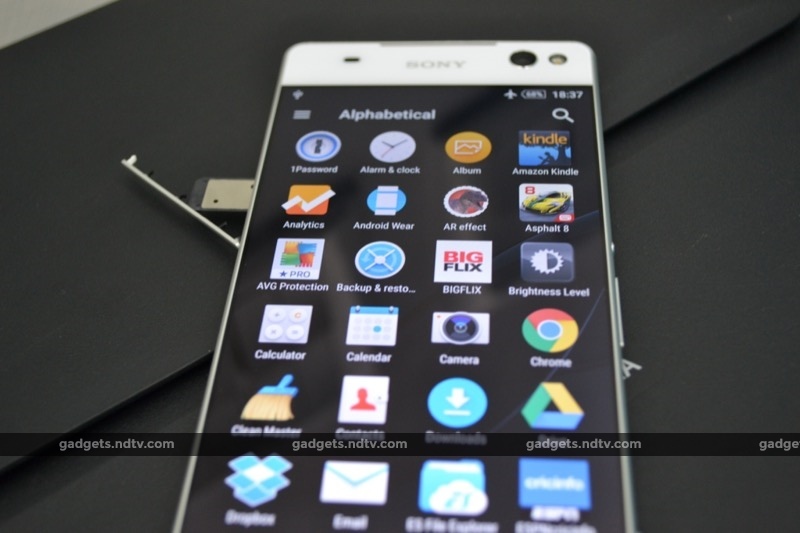 Overall, it’s hard to find a much wrong with the Sony Xperia C5 Ultra Dual. It’s amongst the best big screen phones we’ve come across. The phone was launched in India with a price tag of Rs. 29,990, though it is now available in the market for slightly less. If you are looking for a 6-inch phone, you have other options such as the Asus Zenfone 2 ZE601KL and the Gionee Elife E8 which can be seen as direct competitors to the Sony Xperia C5 Ultra Dual. The Elife E8 is a flagship device, with more features and a higher price tag. The Zenfone 2 ZE601KL is more affordable than the Xperia C5 Ultra Dual, but it hasn’t started shipping in India yet. Further, we haven’t reviewed either of those phones yet, so it’s difficult to comment on their relative merits and demerits as compared to the Sony Xperia C5 Ultra Dual. The Lenovo Phab Plus, which comes with a staggering 6.8-inch display, is another big screen device that’s been announced for the Indian market. There are some other old 6-inch devices still available in the market that you could consider, though none of them can be seen as directly competing with the Xperia C5 Ultra Dual, which is a fantastic phone with a lot to love if you don’t mind its price tag.